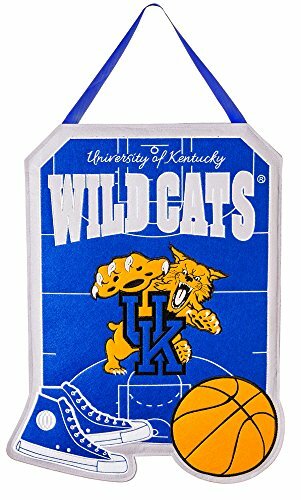 Cheer on your team with this decorative wall or door hanger. Made of durable, medium-weight poly-blend fabric with coordinating grosgrain ribbon, this hanging decor is stitched and lightly stuffed to provide weight and dimension. The weatherproof fabric has the look and feel of wool felt and is safe outdoors year round to continually cheer on your team. The detailed design is not only customized to your team, but also features an officially licensed mascot, logo and colors. This sign measures approximately 16 x 20 x 0.4 inches and is a must-have for any true fan.